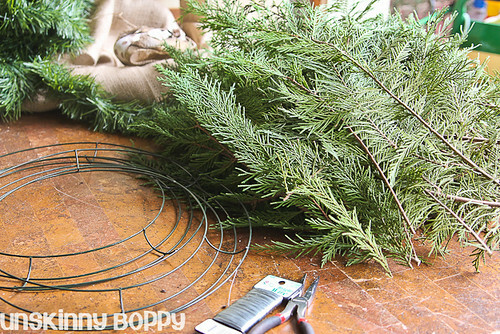 I started out with simple wire wreath forms and a whole bunch of clippings off of the backside of my Leland Cypress tree. 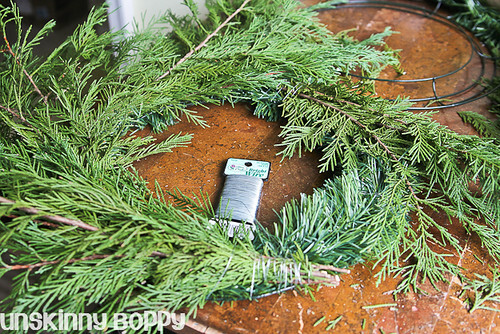 To hide the wires on the wreath form I covered them with a length of fake garland. I wasn’t sure if this step was necessary but I did it anyway before I started just in case. 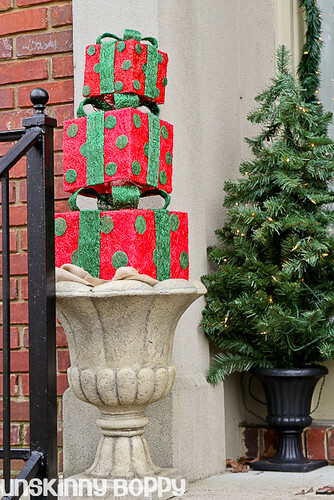 You could stop here if you’re into the Charlie Brown Christmas tree look. I decided to keep going. 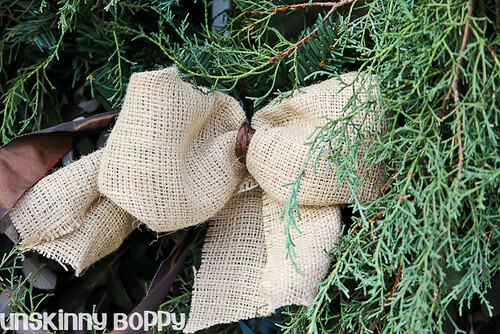 I bundled up a handful of the cypress and wrapped floral wire around the stems to hold them together. And just repeated that process over and over until I had about 6-7 bunches. Then I layered the bunches around the wreath on top of one another until it looked semi-circular. I wrapped each bundle with a long continuous length of floral wire to secure them to the form. You might notice there is twine tied around it in some parts. I gathered up the scraggly branches and forced them into submission with a few pieces of jute rope. I will go back later and cover those up with some kind of embellishment. I haven’t gotten that far yet with my details because I was too busy moving onto other wreaths! 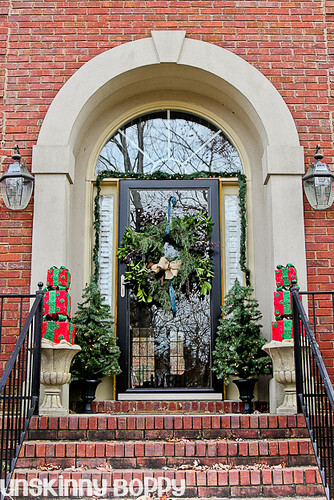 Since I only bought two wreath forms, I started looking all around my house for other things to cover in greenery. 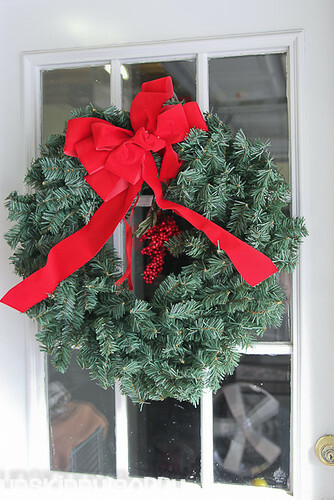 I have a ton of these fake fir wreaths in my attic that I’ve accumulated over the years. They are pretty just as they are, but I’m kind of tired of the whole green wreath/ red bow predictable thing that I’ve repeated for the past five years. I have gotten into a rut of pulling these straight from the attic and slapping them onto the windows and calling it done. Plus they are so prim and proper looking, and I’m just not in a prim and proper kind of decorating mood right now. I want something sloppy and wild and organic looking so this year I decided to froof one of them up just a lil bit. I started out by adding big bundles of loropetalum clippings (the purple stuff). In between those I stuck bundles of fragrant tea olive branches (the green stuff that looks like olive branches). Those things smell delicious! 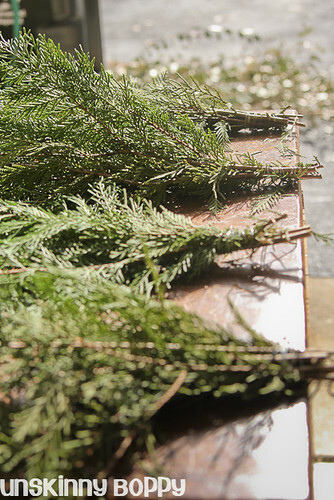 Then on top of the inner circle I added three long bunches of Arizona Blue Cypress from the trees lining my driveway. As a side note: I had no idea what types of evergreen trees were growing in my yard. Thanks to the Grumpy Gardener for IDing them for me on his facebook page. I topped it off with some blue and brown damask ribbon and a little burlap bow that I made from scratch and wired onto the wreath. This sucker is HEAVY now. I hope my suction cup holds up! Not to mention my storm door. It’s so big and lush and full that I can barely open the door. I absolutely love it. It’s been transformed from the original, for sure. It also makes my El Cheapo prelit garland that my husband kindly hung above the door for me look pretty chintzy now. I guess I need to get to adding more evergreens on top of it next! Here is the whole porch. No, I didn’t sweep off the leaves. Check out these cute red and green polka dotted gift boxes I found on sale at Old Time Pottery on Black Friday. They are made from jute, so they are weatherproof…and they light up at night! I’ll be sure to show you guys the rest of the wreaths I made sometime soon, but here is a quick before and after shot of how I transformed the fake frasier fir wreath into something with a lot more impact. So, there you have it. 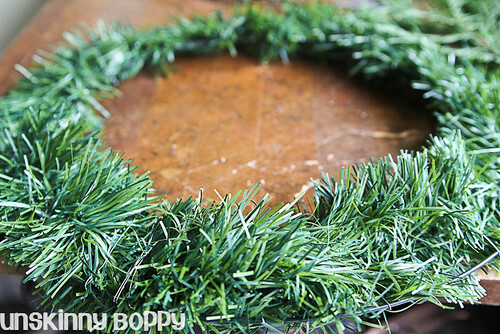 My foray into semi-evergreen wreath making. My fingers got pricked and my forearms are burning from all the scratches, but my windows and doors are going to look better and sloppier than ever! I concur! Big and lush and oh so pretty =) Enjoy!! Love this idea! Thank you for sharing this. I’m definitely going to add some foilage clippings to my wreaths. 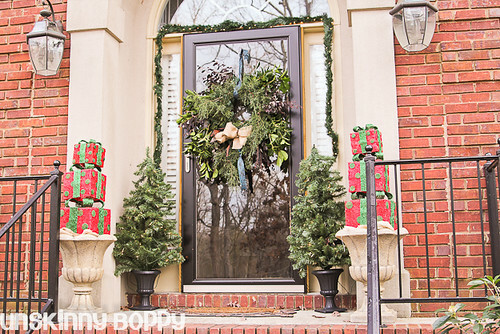 Oh gosh sweetie, your front door looks fabulous! 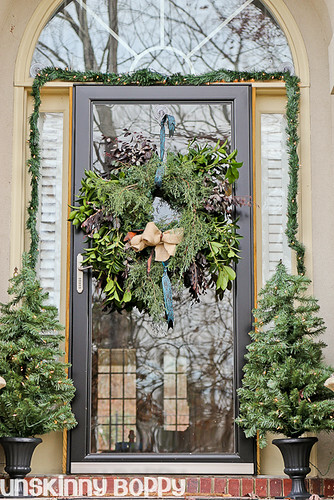 I love, love your wreath and the pressie topiary is just waaayyy too cute! I LOVE LOVE LOVE the “after!! !” Beautiful! 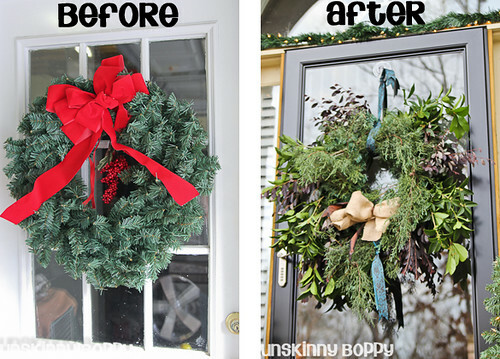 I am a wreath “connoisseur” and your after pic is magnificent. It screams creativity and uniqueness! Great job and thanks for the tips! 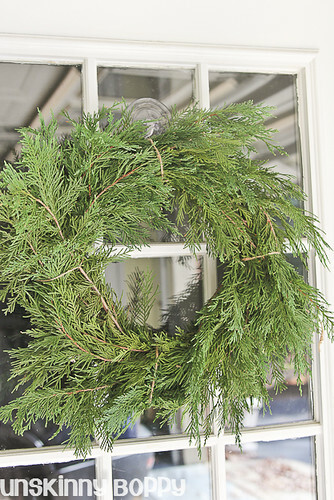 You an your wreath-making readers may be interested not only in the process but also in my book Mama’s Wreaths, draws culturally from wreath making in Southern Appalachia. The skill has been passed along among women who have drawn from the land’s resources. This fragrant story unfolds in a garland of free verse poems and reminds us of the way we touch each other with joy, even when we never meet. 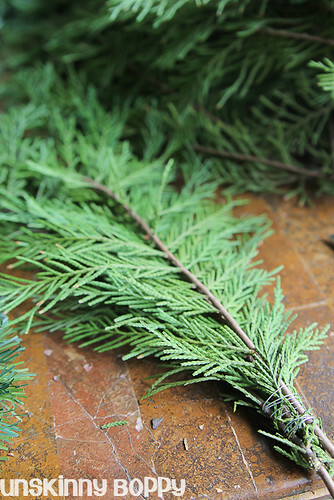 End notes give background for the story and instructions on making a simple wreath. For ages 8 to 108. Keep your own traditions, your own skills, and your own stories—pass them along! This blog having a wonderful content, I liked this. You wrote such a nice content about the Artificial hedges.The decorative outdoor artificial hedges are mostly used by commercial establishments such as cafes and restaurants to cover their outdoor dining areas. There are faux hedges made of high quality polyurethane that look very real. They also have UV protection to ensure that they don’t fade easily under the sun. I love your cheerful and enthusiastic description on how you made this wreath. You don’t need the artificial greens, however, it adds unnecessary weight and you had covered the frame pretty well anyway. 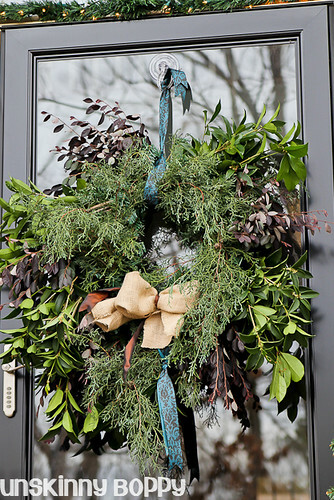 A wreath is a nice way to continuously say hello to passers by and I think your personality is right out there shouting it loud and clear. Don’t stop, the world needs that.